BROWN, PETER, journalist and author; b. 29 June 1784 at Edinburgh, Scotland, the son of James Brown and Jean Lyon; m. in 1813 Marianne Mackenzie, and they had six children; d. 30 June 1863 at Toronto, Canada West. Peter Brown, whose father was a successful builder, became a textile and general merchant. By the 1830s he owned a large wholesale warehouse and was a respected burgess of Edinburgh. As an earnest and well-read Whig-Liberal, moreover, he supported the swelling reform movement in Great Britain, and especially in Edinburgh itself. Accordingly, he was named collector of assessments in the reformed civic administration elected in 1835. But the next year his office became involved in the loss of some £2,800 of public funds that had been mixed up with his private accounts. There was no allegation of dishonesty, and friends who had guaranteed him made good the money. Yet Brown greatly felt the blow to his reputation and determined to make restitution. He found he could not, because of spreading world depression, and so decided to emigrate to America to recoup his fortunes. In April 1837 he and his elder son, George*, aged 18, set sail for New York. There they started a small dry goods business, which flourished sufficiently to enable Peter’s wife and four other children to join them in 1838. But Peter soon acquired an interest in political developments in the United States, and began writing for the New York Albion, a journal of the British emigrant community. Though a parliamentary liberal, he was not a universal suffrage democrat and found sizeable gaps between the Americans’ claims of liberty and the corruption and demagogy of their mass politics. Also a fervent abolitionist, he detested the presence of slavery. Hence he was impelled to write a strong rejoinder to an American critique of things British, The glory and shame of England, written by C. E. Lester in 1841. Brown’s own volume, The fame and glory of England vindicated, published the next year, was a trenchant comparison of British and American institutions and policies that gained considerable attention in Britain, the United States, and in the neighbouring British North American colonies. Perhaps as a result, Peter decided to give all his attention to writing on public affairs. In July 1842 he launched a little weekly of his own, the British Chronicle, intended for the Scottish community in the New York area and in nearby Canada. The newspaper flourished and soon became engaged with the issue then dividing Scotland, the “Great Disruption” of the Presbyterian Church, when the Free Church separated from the main established body. A staunchly evangelical Presbyterian, Peter was eloquent in supporting the Free Kirk party in his paper. Consequently, an invitation came to him from leading Free Kirk adherents in Canada to take up the Presbyterian struggle on the colonial front. He accepted, terminated his first paper in July 1843, and began the Banner in Toronto the following month. His son George worked closely with him on this weekly, as he had on its predecessor. Together, they soon took the Banner into the political conflict in Canada as well as into the Presbyterian religious dispute. The paper indeed became a stalwart supporter of the Reformers’ campaign for responsible government. Their political involvement led to the founding of a wholly political Reform organ, the Toronto Globe, by George Brown in March 1844. Peter and his son Gordon helped to write and edit it, while George still assisted with the Banner, both being published in the same office. By 1848, however, the Globe was demanding increasing attention, the Banner had witnessed the successful establishment of a Canadian Free Church, and Peter was aging. In July 1848 his paper ceased publication, but he still gave himself loyally and busily to his son’s Globe. 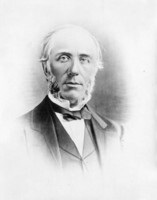 Early in 1850 he retired from journalism, though he remained active for years more in the Toronto Anti-Slavery Society and other philanthropic or reform-inspired groups. Indomitably eager for a political or intellectual argument, yet the soul of kindliness and courtesy, he died in Toronto the day after his 79th birthday. [The biographical material used comes from my study, Brown of “The Globe”, especially chap.1 of vol.I. j.m.s.c.] Peter Brown, The fame and glory of England vindicated . . . (New York and London, 1842). J. M. S. Careless, “BROWN, PETER (1784-1863),” in Dictionary of Canadian Biography, vol. 9, University of Toronto/Université Laval, 2003–, accessed April 24, 2019, http://www.biographi.ca/en/bio/brown_peter_1784_1863_9E.html.